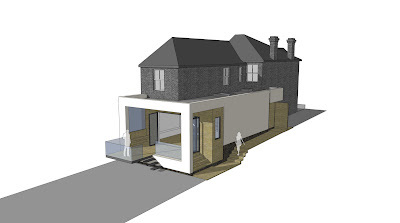 We are pleased to announce that our extension at 76 Hatherley Road has been granted planning permission by Winchester City Council. The scheme was commended by the City of Winchester Trust saying “This is a well designed contemporary scheme that makes an interesting change to the usual rear extension”. The extension provides a contemporary living environment in a traditional dwelling, improving the dwelling’s relationship with the garden. Aesthetically and organisationally the extension is distinct from the original dwelling. This entry was posted on Friday, December 14th, 2007 at 4:44 pm and is filed under Extensions, Planning. You can follow any responses to this entry through the RSS 2.0 feed. Both comments and pings are currently closed.